Does organic food really taste better? At TheCooksDen, we decided to apply the scientific method to that important question. We brought in an unbiased test subject — one who has superior taste buds, is unaffected by marketing hype, and is unafraid to express her opinions publicly. Meet Hammy the Hamster. Hammy was kind enough to participate in hours of rigorous testing in order to get to the bottom of this critical issue. Read on for the results — they just may surprise you. First off, a bit about our technique is in order. Hammy was asked to repeatedly choose between an organic food item and a conventional item of the same type. Click on this video to see documentation of several test trials. Of course, Hammy was not always so cooperative. Like a well-trained athlete, sometimes she just wasn't up to her best. Below see video documentation of several trials where Hammy was not quite so interested in our scientific quest. When all was said and done, Hammy chose organic. In over sixty percent of the trials that resulted in a clear selection, Hammy opted for the organic item. Below is the summary of results, broken down by individual food item. Hammy was 'indifferent' frequently, choosing to groom herself, rest or run away entirely. Those trials are noted below as well. For five out of the six food types, Hammy preferred organic. She did, however, seem to have a preference for conventional walnuts over organic. This fascinating inconsistency deserves further investigation and will no doubt be the subject of follow-up research. Of course, no hamsters were harmed during the filming of these movies. In fact, Hammy got a pretty good feast out of the deal. Music for the videos was provided by Kevin MacLeod at Incompetech.com. If you're looking for music for your movie, I highly recommend his site. Got some ideas on what Hammy should try out next? Maybe a convection oven or a high-end saute pan? Hammy has a discriminating pallet. I’d chalk the indifference up to being full. She did eat her body length in broccoli. Only question is, did you wash the fruits and veggies before the test? The carrots I know came washed and peeled. I could believe her cute lil nose would be repulsed by pesticide smell. I could also believe that eventually the animal instinct to eat-like-it’s-your-last-meal would be strong enough to eat bug-spray veggies. This is the best animal video ever. Hammy should get an Oscar. This proves nothing. If you run a simple test for significance (e.g., a chi-square test), you’ll get a result that shows the differences in Hammy’s choices are more likely due to him choosing randomly rather than preferring organic food. @CO [sigh] We all took stats in college, thanks. Just try to enjoy….I thought it was cute. Very cool idea, and well executed. Nice music. I also love how this was a “family” effort. Maybe she just went for whatever was on the left. A retest with random positioning should answer that. Run each food test 100 times. I bet you get close to a 50/50 average. Cute hamster, though. How do you control for the hamster preferring one area of the cage over the other? Did you swap the food into different areas every trial? Alternatively you can give him only 1 type of food for a certain time, record how much of it he eats. The next time window you feed him the alternative food type and compare how much of each he eats. If food tastes better he will eat more of it. CO claims that this is an insignificant result, but he clearly didn’t do the math. For the 49 trials where the hamster had a preference, the expected number of wins for “organic”, assuming the null hypothesis, is 24.5, and the variance is 49/4 or 12.25, and the standard deviation is sqrt(12.25) or 3.5. We got 6.5 excess wins for organic, which is almost two standard deviations. So we’d certainly be in the 90% range of confidence that something real is being measured. And without the walnut discrepancy we’d be in the 99% region. My math above is a hair off (dividing by N instead of N-1) but it doesn’t significantly affect the result. I echo what others have said, this was not sufficiently random. You need to at the very least swap which side is organic&conventional. For best data practices, you would do well to run the experiment the way Brandon suggests in comment #14, with the time periods being days. Feed a conventional food for several days (in case food change results in decreased appetite) then organic for several days. Repeat several times, analyze the results. What was that cool funk music? Please rewatch the video and read for comprehension before you start blathering about randomization. The choices switched sides. Absolutely great idea, fabulous video! Ease up science nerds; it is a cooking blog not the National Institutes of Science. Just sit back and enjoy the silliness. The out-takes are best by the way. A cute and well done video guys and gals. Bravo! Organic was always on Hammy’s left. Both hamsters I had 15+ years ago, both had a preference for a specific side of their body. When let loose to explore/play in a closed-off (hamster-proofed room) they always follow along the edge of the wall against one side of their body. If I picked them up and turned them around, they’d stop sniff and turn around again to have the wall on their preferred side. Additionally the outtakes show them coaxing Hammy with the organic, which could also introduce a bias (showing the food, and then where it’s located in the ‘pen’). Scientific or conclusive? Not really. But a cute entertaining vid? Of course! It’s being offered as a conclusion to an experiment. Sounds like they’re at least trying to be scientific, and some people are offering advice to improve their method to remove potential biases. The fact that it’s cute doesn’t really come into it. Yes, this is a neat idea. But it is poorly executed. As Mary Sue and Nick suggest, by always putting the organic in the same position relative to the conventional, you may have conditioned the subject over time to select the food on its left. Randomly arrange the organic one and then redo the experiment. Also, run a control (where both offerings are organic and where both are conventional). Also repeat with another hamster (or squid, or duck or badger badger badger badger badger badger badger badger badger badger badger badger ). Interesting experiment. Not as comprehensive as it could be but still interesting. not only is this pretentious, it’s also wrong. ANOVA gives a probability of 1.5% for this being insignificant. The hampster likes organic! Some of you really fail to grasp the concept of “humor” The claim made that this is a ‘scientific” study is made tongue-in-cheek. That is the entire set up of the gag. The table offered to support the conclusion is part of the joke. And the final conclusion is the pay off. Hello!! Why would any rational human being care about the preference of someone’s pet hamster? The entire “experiment” is bogus from the very start–that’s the joke. This was so incredibly cute… thanks for the great video! I think more trials would be necessary ( a larger sample size) to determine if there is actually a preference. You know, multiple hamsters, 20+ choices over multiple days, of course. This has experiment has already been done a little more rigorously but with rats. They preferentially selected organic wheat biscuits over the non-organic type. Umm, hello fellow statisticians. whoever did the ANOVA is wrong, this data doesn’t look at the statistical significance of the difference between means, so that result is irellevant. I think that Joe Buck’s solution looks the most correct, and I think he’s done the right maths to evaluate the binomial distribution properly. The only thing is that I’m not sure what the “no preference” data is showing and its importance. Perhaps the organic walnuts were a teeny bit stale? I have had trouble with that. You’d also need to increase the n of experimental animals. Hammy’s preference may or may not be similar to other hamsters. And like kd said, ANOVA? WTF? The outtakes reveal that you repeatedly lured the hamster in the direction of the organic item. great jorb! Clearly, she prefers food on her left (the viewers right). That’s all. Just by observing the hamster, you are affecting the result. Have you no concept of quantum mechanics? Haven’t you heard about SchrÃ¶dinger’s Cat? Clearly there is a point of contention as to whether this is either funny or scientifically/statistically sound. I think it’s neither, which leaves it being cute. That could have been done without presenting the results that seem to be confusing the purpose of the exercise. I find Hamsters absolutely delicious and I do not care if they have been fed organic food or elephant dung they are still delicious! 4 or 5 make a great meal and it is a much better transfer of fuel to eat hamster meat than say Beef. Come on now who else out there loves to nibble those crispy little feet after a good fry up? After watching the video, I would have to say that no conclusion could be made at this time. It seems that Hammy just seemed to go towards whatever was closer after her initial step of curiosity. If she really preferred organic she would have been even more consistent, with less hits to the conventional products. Also, if you factor in the “indifference”, she chose organic on 40% of the time. Why walnut exception? A recent biological development in the crop trees(2003), could make walnuts more pesticide resistant. He looked pretty hungry in a couple of them. Was this clip meant to draw people devoid of personality out of the woodwork? I think you have a new experiment to pursue. I choose to believe that one hamster sometimes going to his left to choose organic food proves that organic food is better. Nothing you can do to convince me otherwise. Chi square that! A 2-sample t test (using frequency of selection of organic/conventional) indeed shows that Hammie chose organic more often than conventional, at a 95% confidence interval (in this unrandomized sample). An ANOVA using these freqs could show whether there was an effect of fruit type. I think we can be confident that the preference was influenced by the news on the HNN that pesticides build up in cheek pouches and stunt burrowing ability. that is one adorable hamster!!!!! I thought this was very cute. Go organic!!! But isn’t Hammy a rat not a hamster? So it would seem you all are so highbrow as to not be willing to try a tasty Hamster sandwich with some good chips on the side. Purple Penguin makes a good point as Rats are very tasty as well. Now as for all this fuss about organics and carbon foot prints I am morally opposed to just eating stuff that cannot run away or fight back, not sporting wouldn’t you agree. Now as for excellent eating that no one will object to I suggest we eat attorneys. They are just as plentiful as rats and you are much less likely to develop close attachments to them. Sorry for you Brits I should say solicitors and barristers, no matter all quite good on the plate after a little trimming and cooking. Hammy’s preference for the food on his left is just another example of of the left leaning bias in the media. Perhaps a more fair test would be to have guinea pigs included in the test, as everyone knows they tend to be more conservative. While this is certainly a cute video, the first sentence, saying this is a scientific process to determine which tastes better, does not live up to the hype, especially when you look at the outtakes video. Cute? Yes. Scientific? No. Proves organic tastes better? No. This is to small to confirm the conclusion. The data suggest the his choices are random. How about place the items in random order, instead of always having conventional on the hampster’s left and organic on the right. you,my good man, are correct. i used to have a hamster and i nicknamed him hammy! i think its so cute when he stuffs the food in his cheeks!!! First, I applaud this experiment. Flaws and all, this is great fun, and any discussion taking it seriously or impprove the experiment serves to illustrate what is involved in the scientific method. Bravo! Second, if we must take it seriously, then we ought to do it right: I strongly disagree with the statistical comparisons presented so far. A t-test or ANOVA applied here is wrong. This is categorical data and there is no a priori reason to disregard the indifferent results. In a Chi-square test of homogeneity with a null hypothesis of equal proportion of responses (25 each; conventional, organic, indifferent) the exact p-value is 0.1890. Even if we exclude the indifferent responses, the p-value is still 0.0854. Neither of these meet the typical standard for statistical significance (p<0.05). This is not conclusive evidence that Hammy’s choices are anything other than random. Darnit. Strike “impprove”, insert “suggesting how to improve”. Linked! organic foods really do not taste any better than store bought fresh foods. they just cost more. I would think the test was quite legit, since both choices were put at equal distances from Hammy, yet she got her nose in both. I would think it be far more productive next time to spread out the videotaping over several days and give her less a buffet. Even to be Devils Advocate by feeding her some conventional feed seed first, then try the veggies, fruits & nuts as the dessert. The point of randomizing is that there could be other factors interfering with the result. For instance, maybe Hammy is in the habit of going to the left to find food, and here the organic product is always on the left. If the positions were randomized, this experiment could differentiate between “go left” and “go organic”. I’ll have what the hamster is having, please. Yeah….. I watched the outtakes and when the tester wanted the hamster to move quicker he would pick up the ORGANIC vegie and wave it in front of the hamster, or wave a brocoli leaf in front of the hamster and trail it back to the ORGANIC side. >… here the organic product is always on the left. On Hammy’s left, that is. This is a BRILLIANT idea! I’m a huge fan. everyone seems to be saying the same thing: Hammy prefers the left & they should swap things around a bit more. I think they should do a few more tests with more hamsters & move the options around, also, no prompting towards the organic side. Thank you for the education in organic foods. I really love the video of Hammy. This was awsome. I will be sending this page to many of my friends. Thanks. To all the people saying that the food was always on the left: hamsters don’t know left from right, so that doesn’t matter. While I’d agree it’s a really cute video — hey, any rodent set to music will always have some sort of cuteness factor — the out-takes revealed a couple of things that seemed pretty obvious even casually. First, was that the test subject wasn’t always hungry, and the tester seemed to consistently coax the subject toward food. Secondly, the choice of out-takes showed artificial guidance toward the organic versus conventional item. 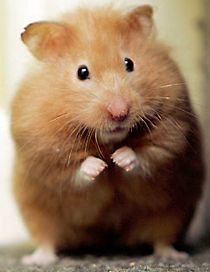 And while a hamster may not know right from left, they can be conditioned to know a location for a specific food item,so it’s possible that the subject could have had previous conditioning to go to a position after being placed down, and just could gravitate there, and that could have upset the test controls. While it’s cute and I understand there is a taste difference, I’m just not viewing this as other than entertaining. Of course it matters; don’t be ridiculous. Congratulations on a wonderful video. Hammy is a real star. I shared the link in my newsletter with about 600 industry execs in the organic and natural food trade, and received some very nice comments back about Hammy. I would like to suggest that some foods represent the difference more than others. For example: organic eggs are significantly different than conventional in both looks and taste. My favorite, popcorn, also is very different. Not sure I could tell the difference between brocoli’s though. Hammy no like broccoli. Love the soundtrack. I think you should experiment with Organic vs Conventional peanut butter. It’s obvious Hammy has enjoyed being the food editor . . . he looks like a huge ham hock! You are my kind of blogger. Might I interest you in joining our CommentLuv community? I noticed that that Hammy was the most “indifferent” to broccoli. As am I Smart girl! I would be interested in seeing if she had a preference for GMO or non-GMO!